The brightest and the faintest planets in conjunction: Venus and Neptune next to each other at 6:45 p.m. on Friday January 13. On Friday evening (Jan. 13), skywatchers will have the chance to see the brightest and faintest planets in the solar system next to one another as they glide across the sky. The bright planet, Venus, has been a brilliant "evening star" for a couple of months now, and will continue to grow brighter until it reaches its maximum on April 30. Meanwhile, dim Neptune has been moving along on the outer edge of the solar system. Astronomers measure the brightness of objects in space using a scale called magnitude. On this scale, the lower an object's magnitude is, the brighter it appears in space. Objects with negative numbers (like Venus) are extremely bright. On Friday, Venus will have a magnitude of –4.03 while Neptune will be +7.95, a total difference of 11.98 magnitudes. What does that mean? A difference of 5 magnitudes on this logarithmic scale equates to 100 times difference in brightness, so a difference of 12 magnitudes amounts to about 100,000 times difference. So Venus will be 100,000 times brighter than Neptune. Very interesting on paper, but can you actually see this event in the sky? 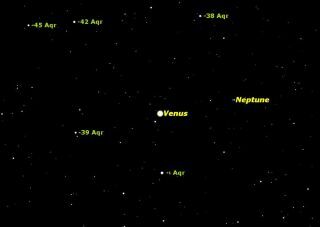 The sky map accompanying this story shows the positions of Venus and Neptune as they will appear on Friday. Check your planetarium software (if you have it) around 7 p.m. on Thursday or Friday (Jan. 12 and 13), the dates on either side of the event, to see which will give the closest distance between Venus and Neptune. On Jan. 12, they will be 1 degree 20 arc minutes apart, and on Jan. 13 the separation will be about 1 degree 9 arc minutes, so Jan. 13 will be the better date. As a reminder, your closed fist held out at arm's length covers about 10 degrees of the night sky, so Venus and Neptune will appear substantially closer than your fist. Now the challenge is to find the best time to observe the event. You will need a low western horizon. Neptune will be very faint, around 8th magnitude, so you need a time late enough that it will be visible, but not so late that it will be too low in the sky. The scientific way is to check the altitude of the sun: –6 degrees is the end of civil twilight, –12 degrees is the end of nautical twilight, and –18 degrees is the end of astronomical twilight, the one we want here. At my location, the Sun will reach –18 degrees altitude at 6:46 p.m.
All the indications are that the optimum time to observe this close conjunction of bright and faint will be around 6:45 p.m. on Jan. 13 for my location. In this case, your mileage will definitely vary, because twilight is very sensitive to the observer's location. So, you will need to use your planetarium software to find the optimum time for your location. It will be interesting to see how it varies from one place to another.